For avid cinema fans in the United Kingdom, 2014’s Still Alice was a film that fell in to the infuriating category of awards darling that wasn’t going to be released in our country until well after all the envelopes had been opened and statuettes had been given out. We had to sit and smile in aggravated silence as Julianne Moore picked up every single high profile Best Actress gong from the Golden Globe to the Academy Award to our very own BAFTA, stewing in the annoyance that I myself would not be able to pass judgement until early March. Other than release date frustration, the other emotion that a situation like this evokes is one of great expectation for the quality of the picture, and so with high hopes in I went to, at last, see one of the most praised performances of the year. Directed by Wash Westmoreland, Still Alice tells the story of Alice Howland (Julianne Moore), a fifty year old linguistics professor at Columbia University who after experiencing a number of small memory incidents is diagnosed with early onset Alzheimer’s disease. The film’s narrative proceeds to provide an exploration of the way in which this cruel disease not only effects Alice’s life but also the lives of her husband (Alec Baldwin) and three adult children (Kristen Stewart, Hunter Parrish and Kate Bosworth), and the altering relationships between them. In the space of one hundred or so minutes the audience witness Alice turn from a highly functioning college academic to a hollow shell of her former self as the disease begins to take hold of her faculties, and it is a sombre and, in carefully strategic bursts, distressing drama to watch. However, what is somewhat surprising about the film given its incredibly heavy subject matter is that it is, in fact, pleasantly light and even humorous in sections. It is this authentic feeling mixture of dark and light that helps the picture to be less of a statement piece about Alzheimer’s and more of a three dimensional, well rounded drama that touches on more issues than just the central theme of mental health. The audience are given glimpses in to the lives of different family members from eldest daughter Anna’s (Bosworth) IVF attempts to youngest daughter Lydia’s (Stewart) floundering acting career, and these forays into other area’s of Alice’s life work to make the impact of her failing health even greater when we begin to see her become more and more detached from these secondary subplots as time goes on. In truth, the scale of the film as a whole is very small. 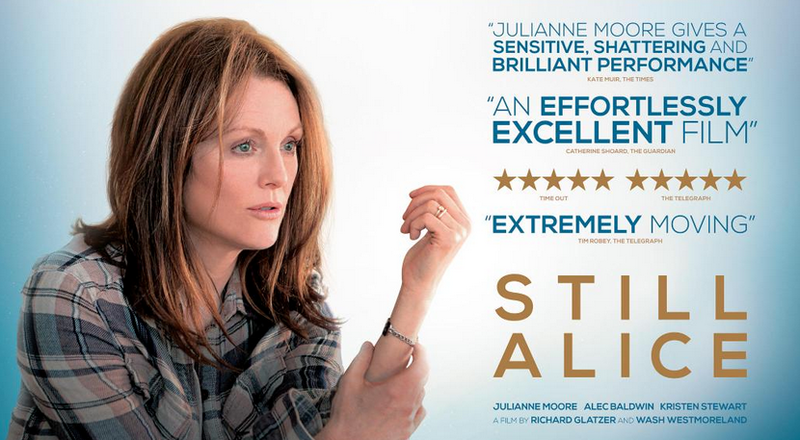 We focus on a family of five who are coming to terms with a bombshell, but what makes Still Alice feel so wide scanning and universally affecting is in the way that the one central plot point slowly works its way in to every corner of the family’s lives. Essentially one is watching the destruction of a family unit from within and it is testament to the light and sensitive hand of the actors and filmmakers that the picture still manages to be so enjoyable to watch and only truly upsetting when it has to be. With regards to the cast, Julianne Moore is, as anticipated, phenomenal. One of the greatest actresses in Hollywood for the last fifteen years with no Oscar to show for it, Moore was finally awarded a statuette in what felt very much like a classic case of “it’s her time”. That is not to say, however, that she didn’t deserve it. Moore plays Alice with a sensitivity, defiance and eventual vulnerability that is heartbreaking to witness. When she is on screen, nothing else matters and that is a classic trope of the kind of film that always wins Best Actress awards and not much else. Alec Baldwin gives an interesting and nuanced performance as husband John, a character who skirts a fine line between sympathetic doting spouse whilst also exhibiting some moments of exasperation and self-centeredness with regard to Alice’s care and how it effects both his personal and professional plans. Hunter Parrish and Kate Bosworth as two of Alice’s children have little to do but do provide endearing character moments on screen, but it is Kristen Stewart who has the most interesting supporting role as the head strong Lydia, Alice’s youngest daughter. It is made clear that the mother/daughter relationship between Alice and Lydia is one of equal parts love and conflict, and the way in which the two women find a way to cope with their differences whilst at same the time coming to terms with the disease is arguably the most rewarding element of the picture. Stewart is her typical awkward, insular self but in this case it completely works for the character she is playing and the on screen chemistry between her and Moore is enjoyable to watch. Overall, Still Alice follows in the footsteps of films like Blue Jasmine and The Iron Lady in the sense that it is a well executed, solid piece of film making that puts all of its eggs in one basket in the form of its lead actress. Of course, the serious and emotive subject matter of the picture elevates it in to a more prominent dramatic bracket, but when it really comes down to it, Still Alice is a good film made great by the Oscar winning performance of Julianne Moore. A must see for her performance alone but also a rewarding family drama with a heartbreaking overriding theme. A well written and informative review! Although I have yet to see it, It did come across to me as the sort of film where the female main propels the entire story- some nice insight there. I will definitely be putting this on my movie list! I’m really looking forward to this film!